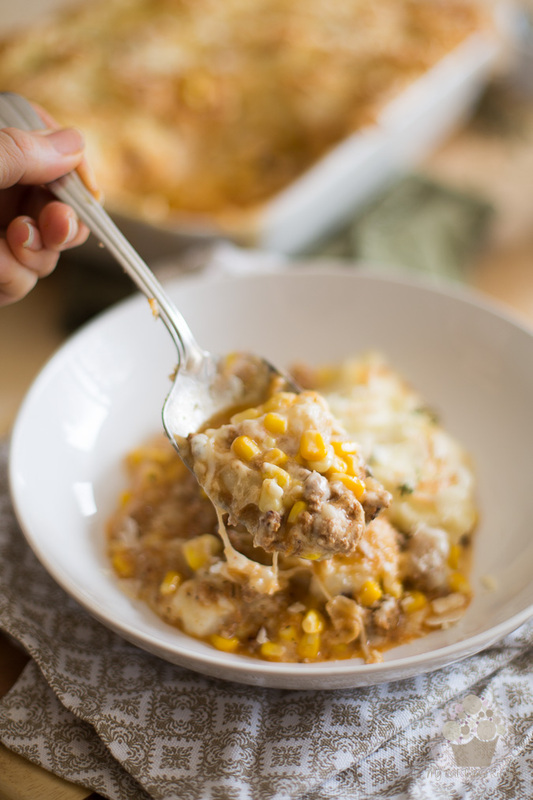 This Cheesy Shepherd’s Pie is not your standard Shepherd’s Pie! 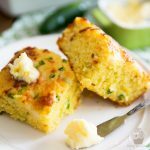 It’s sinfully creamy and of course, it’s LOADED with cheese. To try it is to adopt it! Back in the very early years of my adulthood, whenever I’d make Shepherd’s Pie, my best friend of the time would always strongly hint and suggest that I should add cheese to it. I always systematically refused, purporting that it would be a total waste. Truth be told, it’s probably that I was a little cheap, back then. Or maybe it’s just that I had learned from my late dad that one had to go easy on cheese when using, ‘cuz that stuff was expensive, you know. In retrospect, I think he was saying that because we (as in my brothers and I) perhaps had a tendency to go overboard when using the cheese that he would purchase with his hard earned money, and he probably wanted there to be some left in the fridge when he reached in there for a piece. Plus, I knew full well that my friend would be smothering his Shepherd’s Pie in ketchup (if you want to truly insult me, put ketchup on anything I cooked, save for maybe a burger…), thus completely wasting the precious cheese that I now was purchasing with my hard earned money. So my saying that adding cheese would be a complete waste wasn’t a total lie, after all. It wasn’t until years later (i.e. a few weeks ago) that I started toying with the idea of giving his suggestion a try… Only when I did, I took the concept straight to the next level. Not only did I add cheese to the dish, but I also covered the corn in a creamy, cheesy Bechamel sauce. The dream! 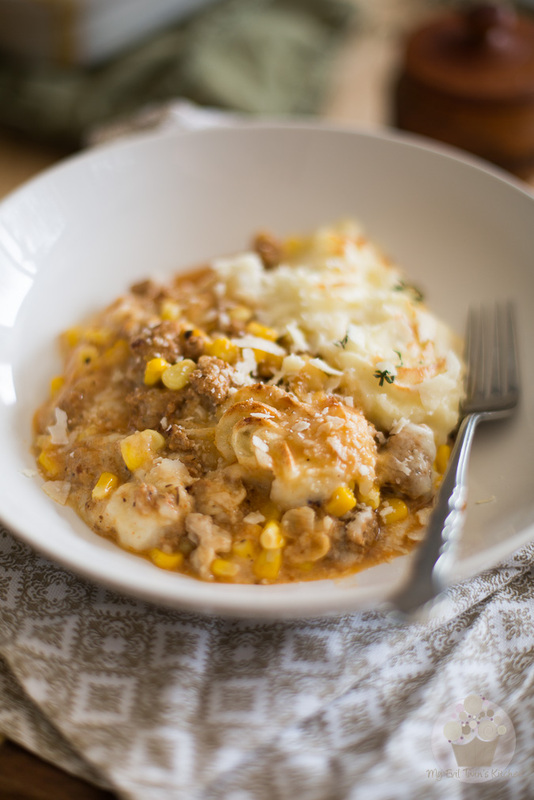 And so this Dreamy, Cheesy Shepherd’s Pie was born. I must say that, while I was extremely pleased with this dish, it didn’t turn out exactly like I’d envisioned it. Oh, it was absolutely delicious, don’t get me wrong, and worth every single calorie, I swear. Still, I’m afraid I’m gonna have to leave this one of my list of upcoming indulgences and revisit it, someday. If only because well, yeah… it was that good! 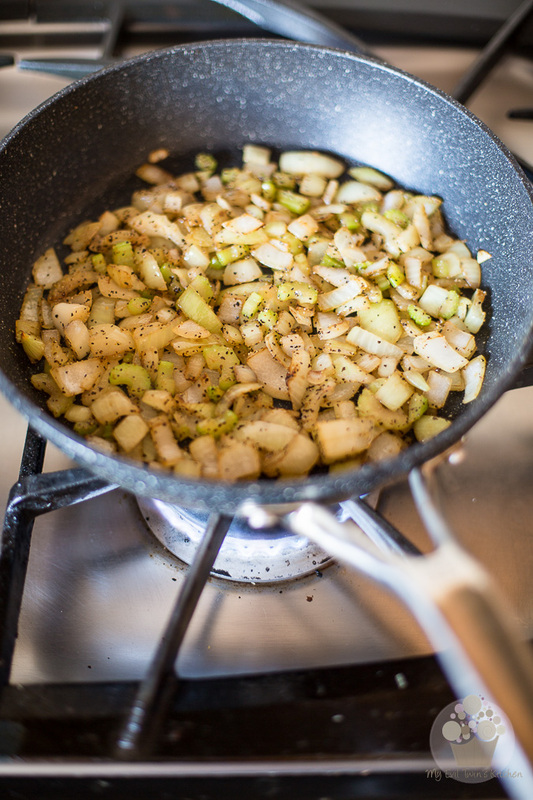 Melt the ghee (I like to use ghee because it doesn’t burn, but feel fee to use butter or olive oil if you prefer) in a large skillet set over medium-high heat and then throw in the onion, celery, garlic, salt and pepper; cook until softened, fragrant and slightly colored, about 5 minutes. 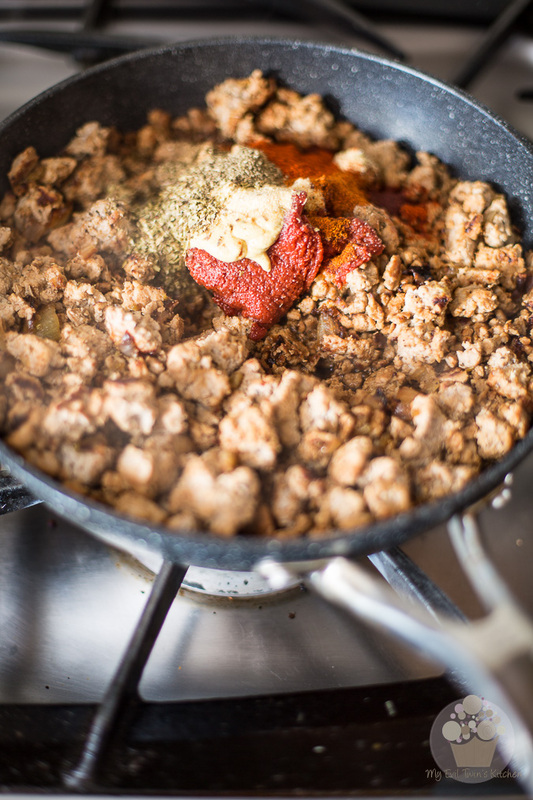 Crank up the heat to high and add the ground meat. 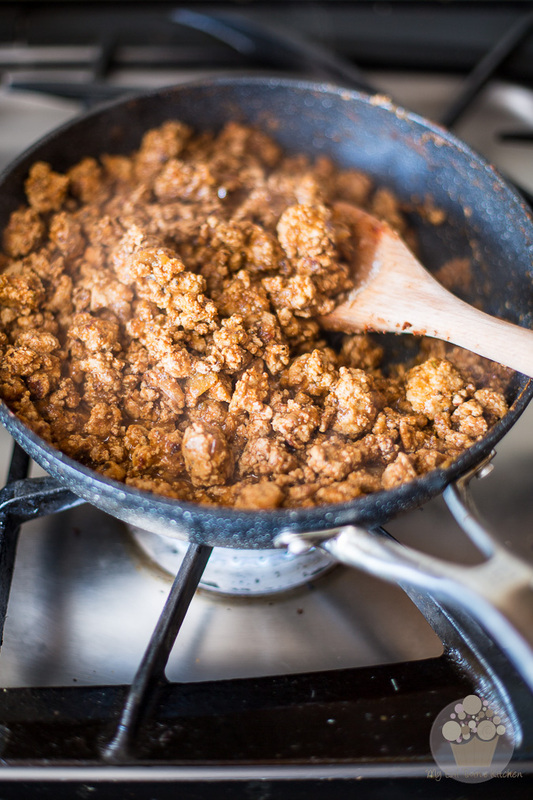 Break that meat into little pieces with a wooden spoon and cook it until it is nicely browned. Add the tomato paste, Dijon mustard and remaining herbs and spices; mix well. Throw in the water, lower the heat and simmer slowly, uncovered, for about 5 minutes or until the water is practically all gone. Set aside. 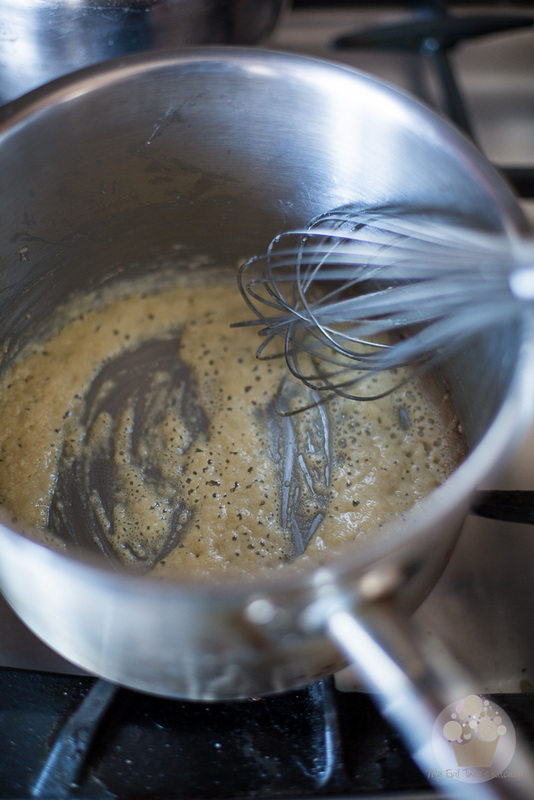 In a medium saucepan, melt the butter over medium heat, then add the flour, salt and pepper and whisk until well combined. 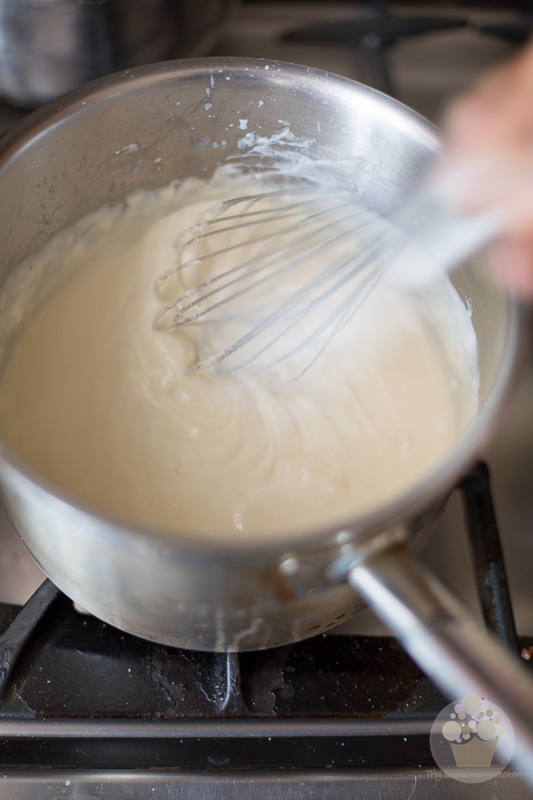 Continue cooking while whisking constantly until the flour turns slightly golden, about 2 to 3 minutes. 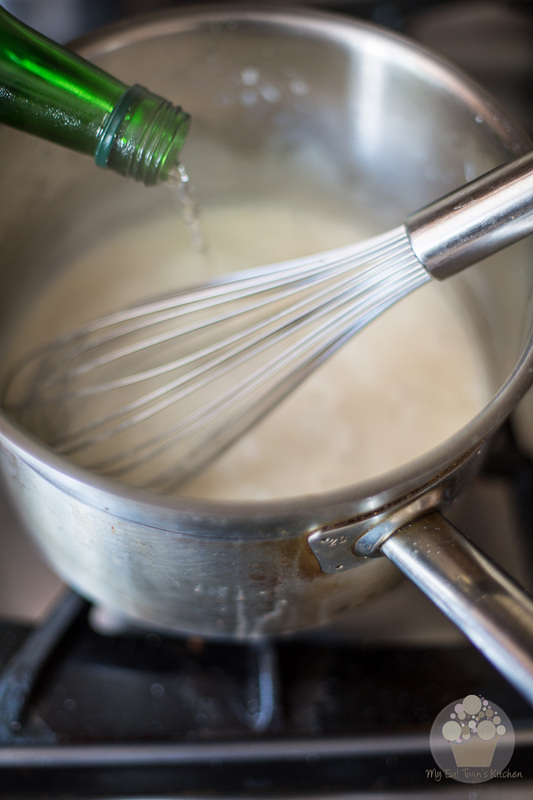 While whisking, add the cold milk in 3 to 4 parts, and continue whisking vigorously until the milk is well incorporated and the sauce is nicely thickened between each addition. If you were to add the milk all at once, you’d run the risk of getting lumps to form in your bechamel, which is something you really don’t want to see happening! 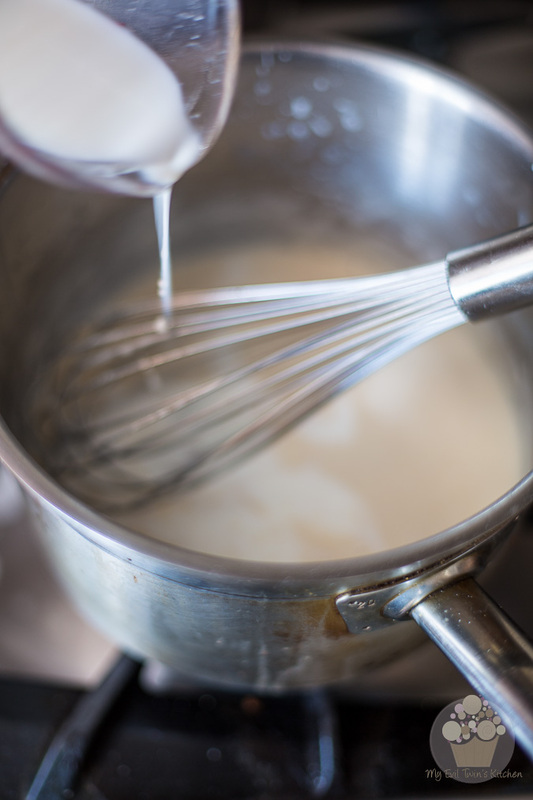 Add that milk slowly, whisk, whisk, whisk and whisk some more, and you will be rewarded with a beautiful, thick and silky bechamel. Once the sauce is fully thickened, add the vermouth and whisk again, until the booze gets fully incorporated. 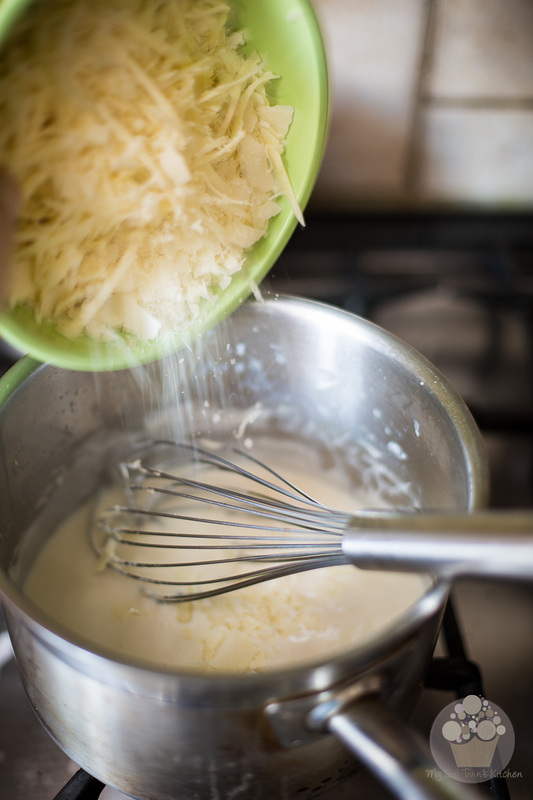 …and mix delicately until all cheeses are fully melted and the sauce is thick but smooth and creamy. Now would be a good time to taste your sauce and adjust seasoning, if required. Add a little bit more salt and ground white pepper, if you feel it’s necessary. Be careful with the salt, though, as cheese is already plenty salty in itself and we will be adding even more later. As for the pepper, I prefer to use the white variety when making bechamel mainly for aesthetic reasons, but also because I find its slightly more aromatic flavor profile goes really well with this particular sauce. If you don’t have any handy though, by all means don’t you go running to the nearest store to get some. You wouldn’t be ruining the entire dish if you were to use black pepper. Years ago, I read that when cooking food in water (such as pasta, rice, potatoes or vegetables) your should taste your water and make sure it’s “salted like the sea”. That trick has really stuck with me, since, and I must say it works like a charm, resulting in perfectly salted food every single time. 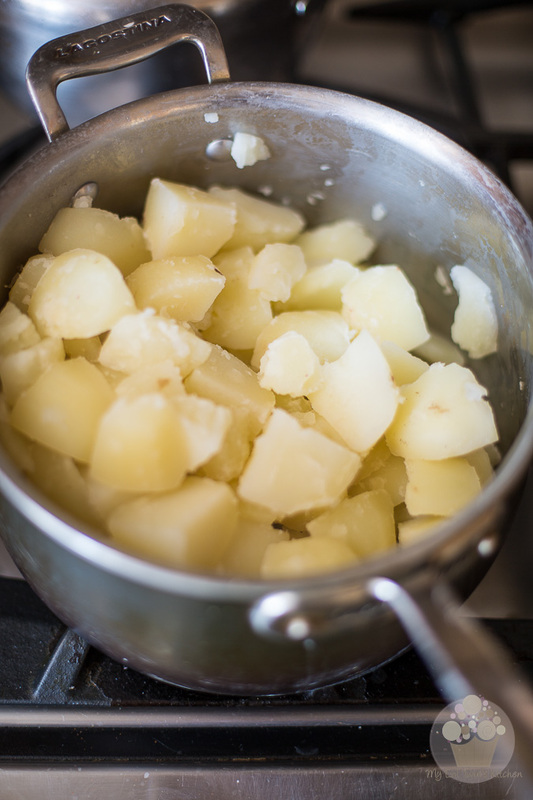 So cook your potatoes in salted-like-the-sea boiling water until they become really soft and practically fall apart. Drain well and return to the saucepan. Note that you could cook your potatoes while working on the bechamel sauce. Just make sure you don’t cook them too much in advance, as potatoes that are destined to be mashed should never be left to sit for too long; that would result in a somewhat chewy and “elastic” puree. 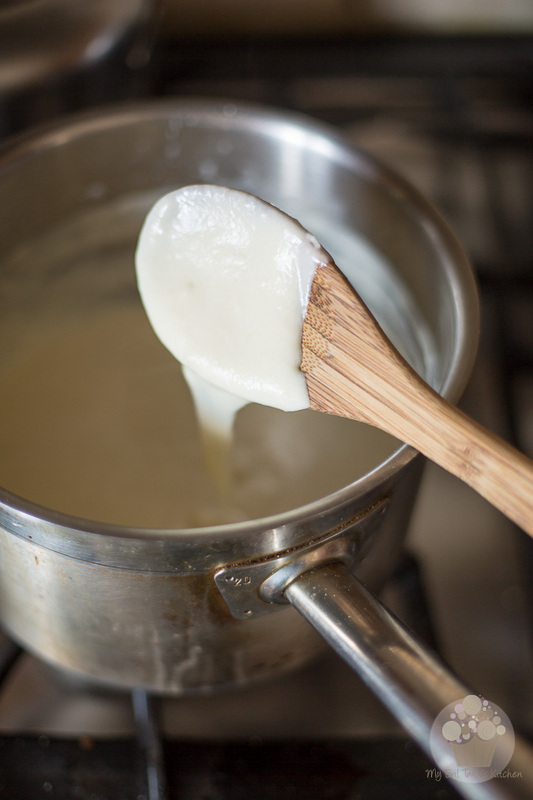 Add the cold butter and about half the warm milk to the pot, then mix with an electric mixer on low speed until the potatoes break down and the puree starts to come together. Then and only then will you increase the speed to medium, unless your idea of fun is to send chunks of potatoes flying all over your kitchen! If like me you prefer to keep your potatoes safely in the saucepan, make sure that you start nice and slow. You could even begin by mashing your potatoes slightly with a potato masher, if you wanted to play it real safe, but I find that just uselessly dirties an additional piece of equipment. 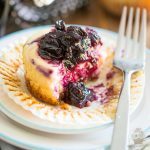 Just go slow and low with the hand mixer and you’ll be just fine. Add the rest of the milk, a few tablespoons at a time, mixing well between each addition, until the puree becomes nice and fluffy. Don’t go adding all the milk in one go because, depending on the amount of moisture and starch that’s in the potatoes, you might not need to use it all. Add too much milk and you will end up with runny puree, which would be highly undesirable. 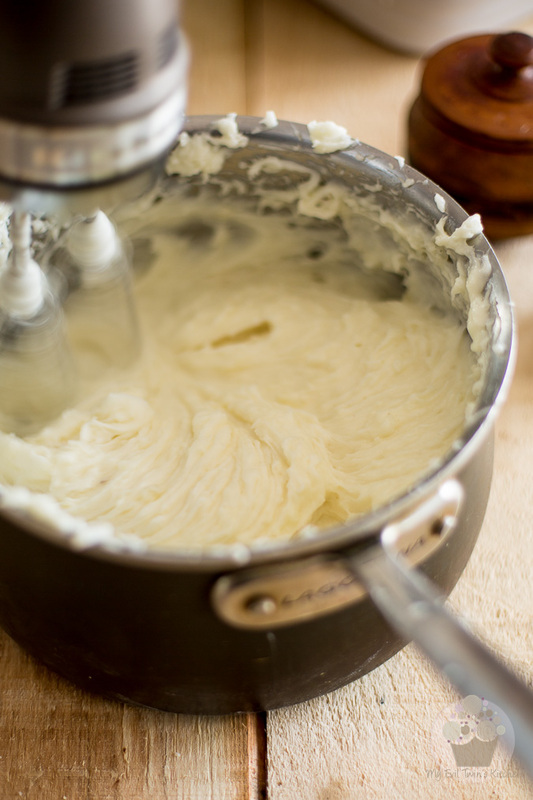 You need that puree to be firm but fluffy, kind of like buttercream. Once the puree is to your liking, adjust seasoning by adding a little bit of salt and white pepper, to taste. 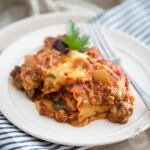 Start by preading the meat mixture at the bottom of a 9″ x 13″ lasagna baking dish. 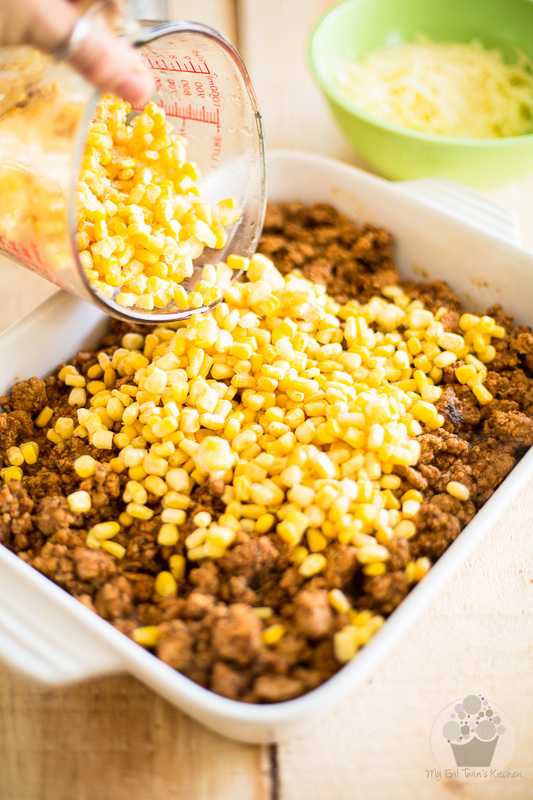 Top the meat with the thawed and drained corn kernels. 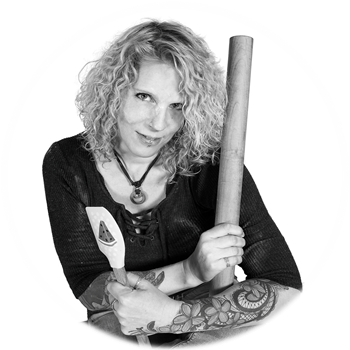 Here, you need to make sure that your corn is really well drained. If it still contains water, you will end up with a great big pool of water at the bottom of your dish, which again, is really not desirable. If you need to thaw that corn in a hurry, simply place it in a colander and run some cold water over it, until it’s completely thawed. Then, place a weight over it, such as a few cans, to help push the water out. 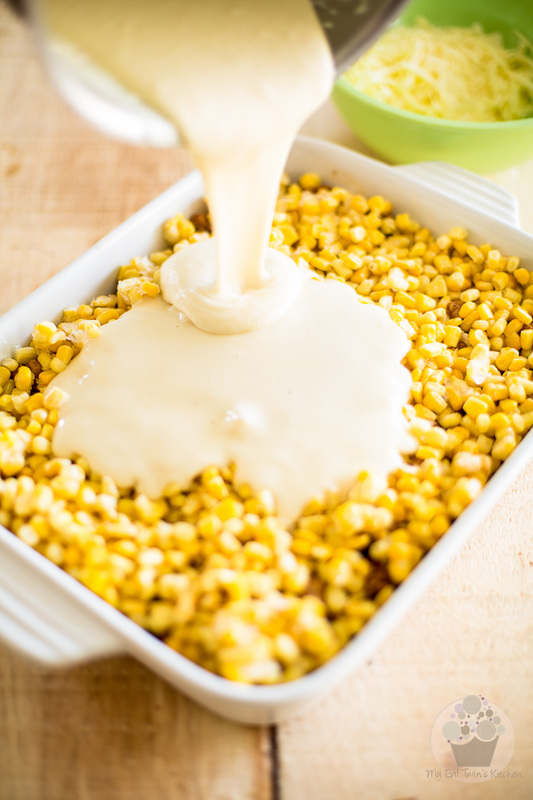 Now pour that beautiful cheesy bechamel sauce and spread it evenly across the corn layer. …and finally, top with the mashed potatoes. If you want to be fancy, do like I did and whip out a pastry bag and star tip to pipe little swirls of potato goodness all over the top. 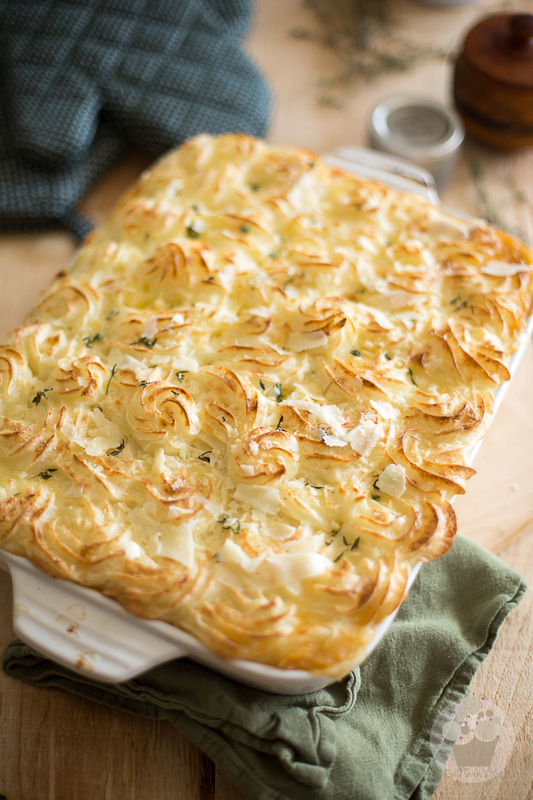 Bake your Shepherd’s Pie in a 375°F oven for 25 minutes, then remove it from the oven and switch the settings to broil. Brush the top of the potatoes with a tablespoon or two of melted butter and then place the dish under the broiler for about 5 minutes, or until the top becomes nice and golden brown. Remove the dish from the oven and garnish with chopped fresh herbs and more grated Parmesan, if desired. Allow to rest for 15 to 20 minutes before serving. If you were to serve it right away, it would be way too hot anyway and you’d only end up burning your tongue. Plus, it’ll taste much better after it’s had a chance to cool down some. Melt the ghee (or butter) in a large skillet set over medium-high heat and then throw in the onion, celery, garlic, salt and pepper; cook until softened, fragrant and slightly colored, about 5 minutes. 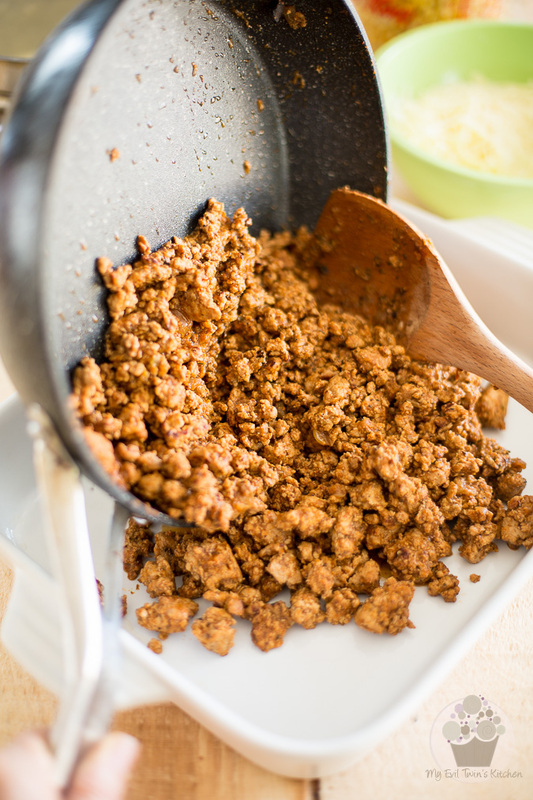 Crank up the heat to high and add the ground meat. Break that meat into little pieces with a wooden spoon cook it until it is nicely browned. Add the tomato paste, Dijon mustard and remaining herbs and spices; mix well, then throw in the water, lower the heat and simmer slowly, uncovered, for about 5 minutes or until the water is practically all gone. Set aside. 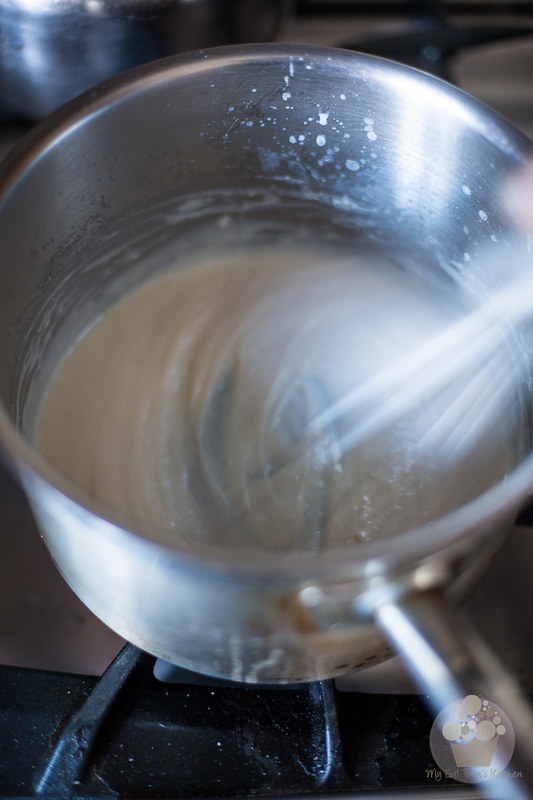 Make the bechamel sauce: In a medium saucepan, melt the butter over medium heat, then add the flour, salt and pepper and whisk until well combined. 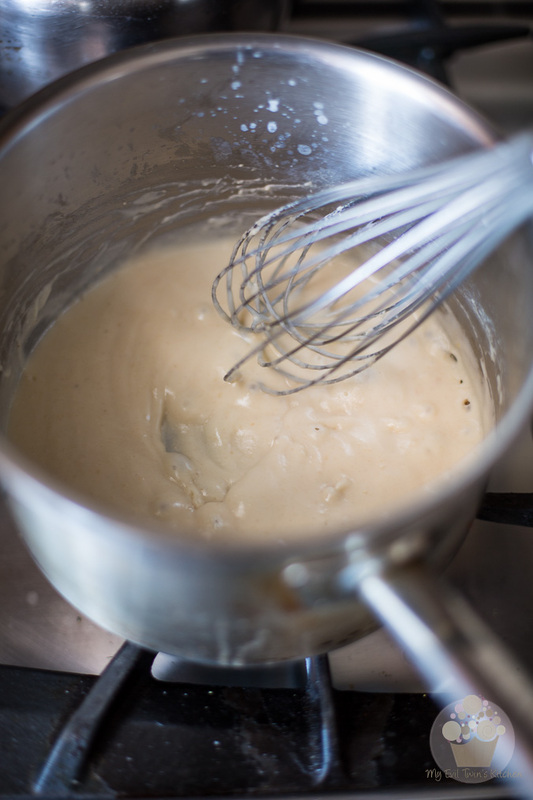 Continue cooking while whisking constantly until the flour turns slightly golden, about 2 to 3 minutes. Add the vermouth and whisk until fully incorporated. 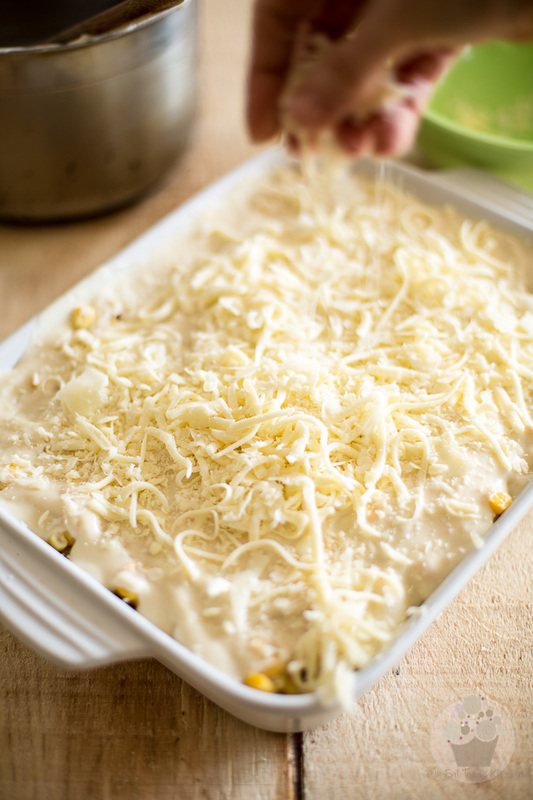 Throw in the grated cheeses and mix delicately until all cheeses are fully melted and the sauce is thick but smooth and creamy. Adjust seasoning, if needed. Cook the potatoes* in salted boiling water (your water should be "salted like the sea") until they become really soft and practically fall apart. Drain well and return to the saucepan. Add the cold butter and about half the warm milk. Mix with an electric mixer on low speed until the potatoes break down and the puree starts to come together, then increase the speed to medium. Add the rest of the milk, a few tablespoons at a time, mixing well between each addition, until the puree becomes nice and fluffy. Taste for seasoning and add salt and white pepper, to taste. 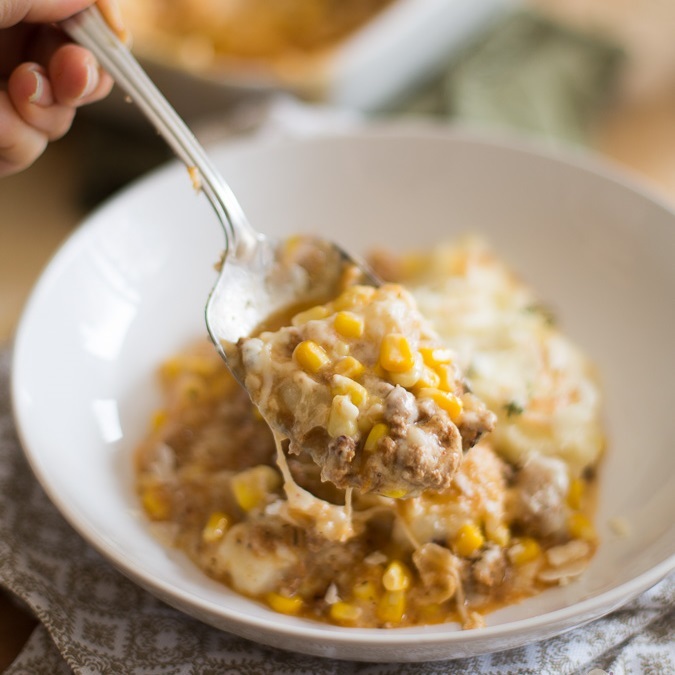 Spread the meat mixture at the bottom of a 9" x 13" lasagna baking dish then top with the thawed and drained corn kernels, followed by the bechamel sauce. 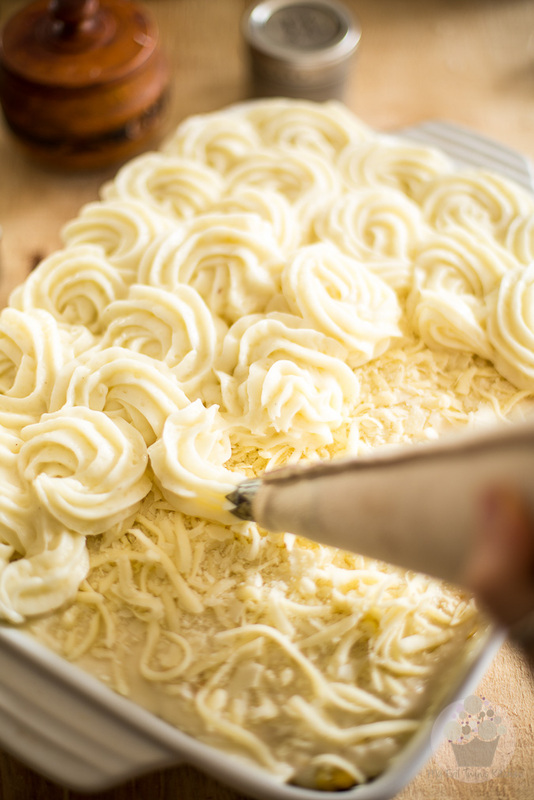 Sprinkle with the additional grated cheeses, and finally, top with the mashed potatoes. Bake in a 375°F oven for 25 minutes, then remove from the oven and switch the settings to broil. 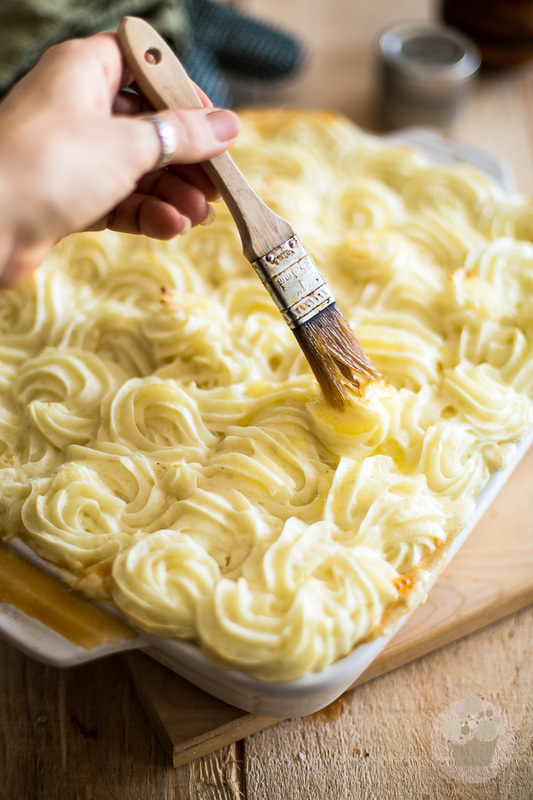 Brush the top of your shepherd's pie with a tablespoon or two of melted butter and then place it under the broiler for about 5 minutes, or until the top becomes nice and golden. Remove from the oven and allow to rest for 15 to 20 minutes before serving. Garnish with chopped fresh herbs and grated Parmesan, if desired. 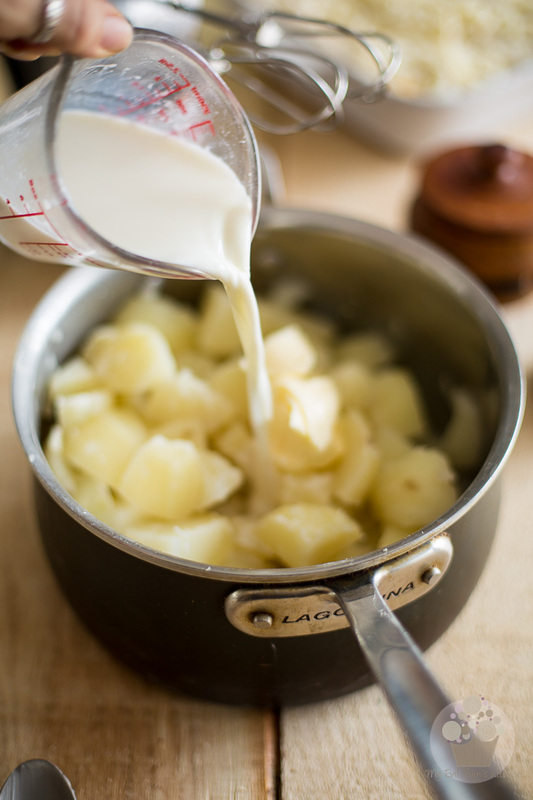 *you can cook your potatoes while working on the bechamel sauce. Just make sure you don't cook them too much in advance, though, as potatoes that are destined to be mashed should never be left to sit for too long; that would result in a somewhat chewy and "elastic" puree. 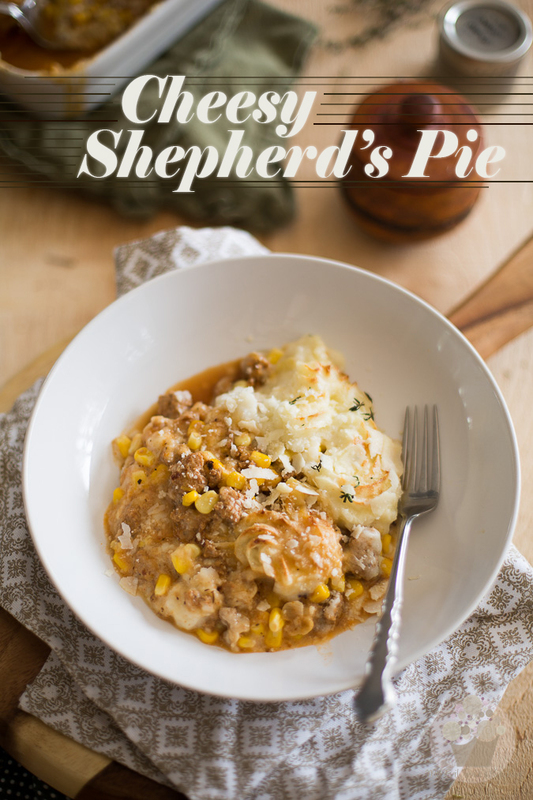 I put this on the dinner list and my husband whined remembering shepards pie as a kid and hating it. As soon as he tried this, he said it was the greatest dish he has ever tasted. He ended up eating 4 full plates worth (and is now painfully regretting that). 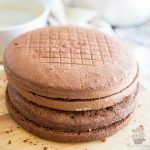 I followed this recipe to a T– was delicious!!!!! !